English: Photograph of Queen Elizabeth II riding to trooping the colour for the last time in July 1986. 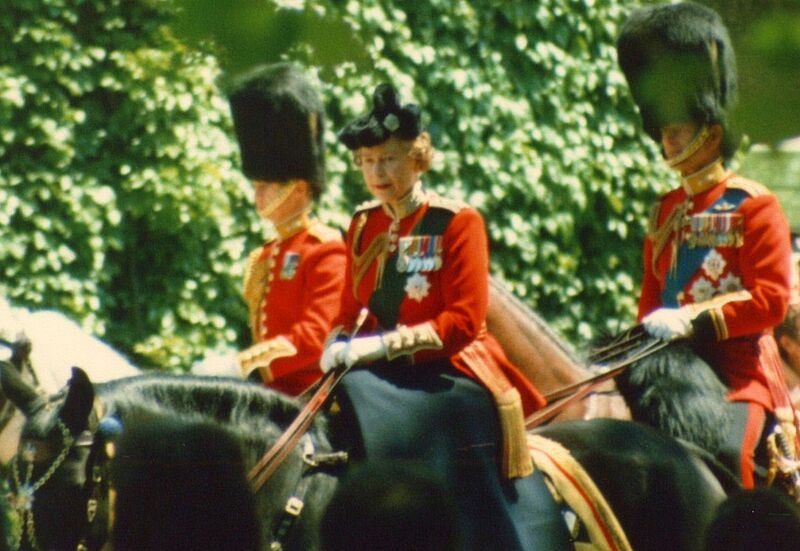 The queen rode the same horse, 'Burmese', originally presented by Canadian government, from 1969 to 1986. With Charles, Prince of Wales, on the white horse to the left, and Philip, Duke of Edinburgh on the bay horse behind the Queen. This is a retouched picture, which means that it has been digitally altered from its original version. Modifications: Crop. The original can be viewed here: ElizabethIItroopingcolour.jpg. Modifications made by SilkTork. This work has been released into the public domain by its author, Sandpiper at the विकिपीडिया project. This applies worldwide.